The 1999 CBC Massey Lectures, "The Triumph of Narrative - Storytelling in an Age of Mass Culture"
Of all the ways that people have learned to communicate with each other, the story is the most human, the most flexible, and perhaps the most dangerous. Storytelling is the only form of expression and entertainment most people enjoy equally at the age of three or seventy-three. Storytelling was as important to preliterate people as it is to those of us living in an information age. The most striking fact about the 20th century is the rise of what might be called, "industrialized narrative." Through print, movies, radio, television, and the internet we absorb more stories than our ancestors could have ever imagined. This is the century of mass storytelling. 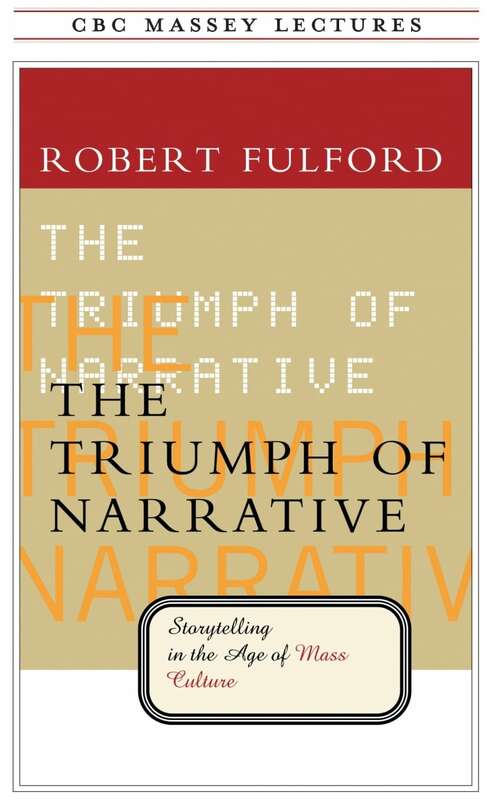 Journalist and critic Robert Fulford tells the story of how stories live and breathe at the heart of our culture. The Triumph of Narrative: Storytelling in the Age of Mass Culture is published by House of Anansi.